ICARUS open for Christmas and New Year’s! At a 10% DISCOUNT! Fresh from major yard maintenance! Captain Barry Duck and Chef Sophie Bardon have pampered guests on ICARUS for over 8 years. Sleeps 6. The aft master has a walk-around queen plus spacious bath with twin sink vanity, stall shower, toilet and bidet. Two guest cabins offer two lower single beds each and full baths with stall showers. $58,445/2 x bar, glic, fees, taxes, comm & dock. 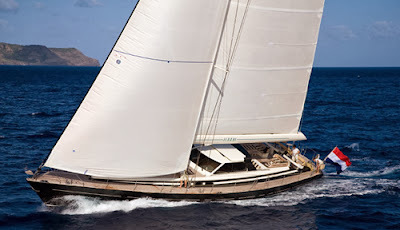 ICARUS is a Jongert Doug Peterson designed 27m yacht. She offers sufficient space and volume for a luxurious interior layout and also her sleek design makes her a great sailing performance yacht. ICARUS features a deck saloon that has a roof that completely slides open and a cockpit settees that transform into sunbathing lounges. The interior is styled in whitewashed teak with brushed stainless steel detailing, creating a light, modern atmosphere. ICARUS can accommodate 6 guests in 3 cabins. The Master cabin has a double bed, shower and toilet. Two Guest cabins have a twin bed, shower and toilet. ICARUS is fully air conditioned through out. The voltage onboard is 220 volts. Smoking is allowed on deck. Crew are non-smokers ICARUS´s crew has a separate companionway, heads and shower. ICARUS carries 4 crew.